Home > Feel Good Theatre Breaks & Musicals & Top Shows > Mamma Mia! The back catalogue of Abba, one of the most successful bands ever is combined with a great original story set on a Greek Island. Mamma Mia theatre breaks, with tickets and hotel accommodation, are a great night out in London. Like any bride, our heroine wants her father to give her away. But who is her real dad? On the eve of the wedding three men arrive in a small Greek village not knowing why or to what they have been invited!! Enjoy the songs of ABBA whilst you watch Sophie Sheridan, the gal who is just about to get hitched, and her mother, Donna, who has to deal with three ex-boyfriends turning up out of the blue! It really is a super dooper ABBA Break! “A glorious evening of fun!“ – Daily Mail. Mamma Mia Theatre Breaks opened at the Prince Edward Theatre on 06 April 1999, where it had previewed from 23 March that year. It moved to the Prince of Wales theatre five years later and finally transferred to the Novello Theatre, in September 2012. Did you know that Mamma Mia has been running in London for over 19 years and seen by more than 60 million people in 38 productions in 14 different languages? And the film has grossed more than £1.29 billion at the box office worldwide. The music is by Abba’s Benny Andersson and Björn Ulvaeus and book by Catherine Johnson. Recently producer, Judy Craymer, was heard to comment that we should not discount a sequel!!! The musical is kept fresh by a never ending supply of excellent new cast members. 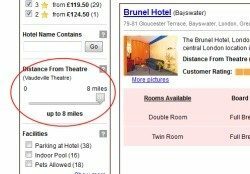 There are some great nearby hotels but it is really easy to get to from anywhere in London, so you don’t necessarily have to pay West End prices if you don’t want to book expensive Mamma Mia Theatre Breaks! If you do want to be a short walk from the theatre then the 4 star deluxe Kingsway Hall is nearby. The 3 star Strand Palace Hotel is also close although for Five star comfort book the Waldorf or the Savoy! Further afield, or if you want to be mainly in another part of London and then just come into Theatreland for the evening, any hotel on the Piccadilly Line would be within easy access and access to the Northern Line and Bakerloo lines is a short walk down the Strand to Charing Cross Tube Station so there really is lots to chose from. Look at Kensington with its world famous musuems as a great (and slightly cheaper) area to stay. Also look aout for Mystery Hotels which offer even greater discounts and excellent quality. Nearest Tube: Covent Garden on Piccadilly Line or Holborn on Central or Piccadilly Line. by Ann Smith on Mamma Mia! We went to see Mamma Mia! and had a fantastic night - great cast, great songs, brilliant dancing and felt so good when I left the theatre although I was a bit hoarse from singing too much!! 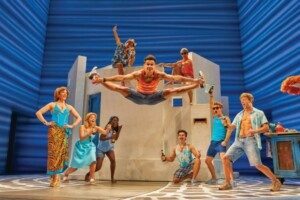 by Jane Wright on Mamma Mia! Mamma Mia! - the best feel good show in London. Have seen it 3 times and will go again. by Deborah Fraser on Mamma Mia! I recently saw Mamma Mia - lovely, joyous show which we all enjoyed. We loved the end when the audience joined in. Fantastic! by Miss Park on Mamma Mia! The one show I can't stop going to see is Mamma Mia!, within a few minutes of watching you will be on your feet dancing & singing, the cast show Abba's music off at its best! Seen this a couple of times and still enjoy it. Took my two boys along last time and even they came out singing all the well-known tunes. A great feel-good show for all ages.